Cars 3 is now available on digital, and one of its deleted scenes has been shared online, courtesy of USA Today. In an earlier version of the film, Lightning experiences betrayal at the wheels of Sterling (Nathan Fillion), the new owner of Rusteze. Sterling was skeptical of Lightning’s ability to race, preferring him to retire. But in this version, he replaces Lighting with Cruz Ramirez (Cristela Alonzo), his beloved new trainer, early on. Watch the clip below. No doubt Cars 3 would have been a much more dramatic film had this scene remained. And it is interesting to speculate how Lightning and Cruz’s relationship would have evolved. There are so many directions encompassed in the filmmaking process, and it’s wonderful that Pixar shares them with us, including the directions not taken. While this scene contains some emotional weight surrounding Lightning’s journey as he’s pressured to retire, it’s for the best that it was cut. Director Brian Fee explains why brilliantly. See this deleted scene and plenty more extras when you pick up Cars 3 on digital. With Cars 3 being released digitally on October 24th and on Blu-ray on November 7th, we’re excited to see all the deleted scenes and extras and get an insight into the movie’s production process. Pixar have already treated us to one particular deleted scene – “The Boogie Woogie” – which features Cruz Ramirez and Lightning McQueen training on the beach. You can watch it below! 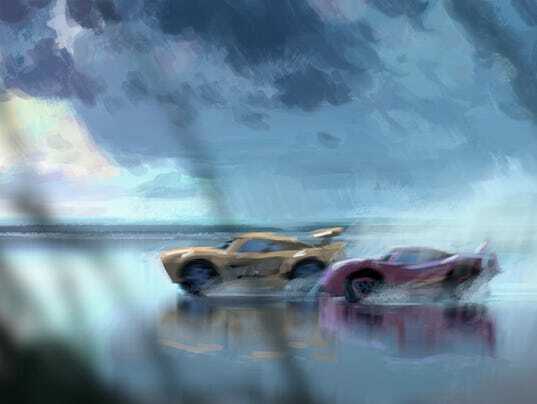 Cars 3 director Brian Fee talks us through the deleted ‘beach training’ scene, explaining that in this version, Cruz was much more experienced. In the final cut, Cruz ended up struggling to drive on the sandy terrain, skidding about all over the place, but this alternate deleted scene shows her driving faster than the Lightning McQueen right from the get-go. Her little ‘good luck charm’ routine that she likes to perform before a race is also incredibly endearing. Who knew these deleted scenes could make Cruz Ramirez even more likeable? The Cars trilogy is quite unique among franchise films. The first film in 2006 chronicled Lightning McQueen’s growth from arrogant rookie to humble racer with a deeper understanding of the road. Five years later, Cars 2 shifted gears and protagonists entirely. This time Mater was thrust into the spotlight, the unlikely hero of an international spy adventure. Now Cars 3, from director Brian Fee, has centered #95 again. It echoes the first film in a beautiful, wholly distinct way. 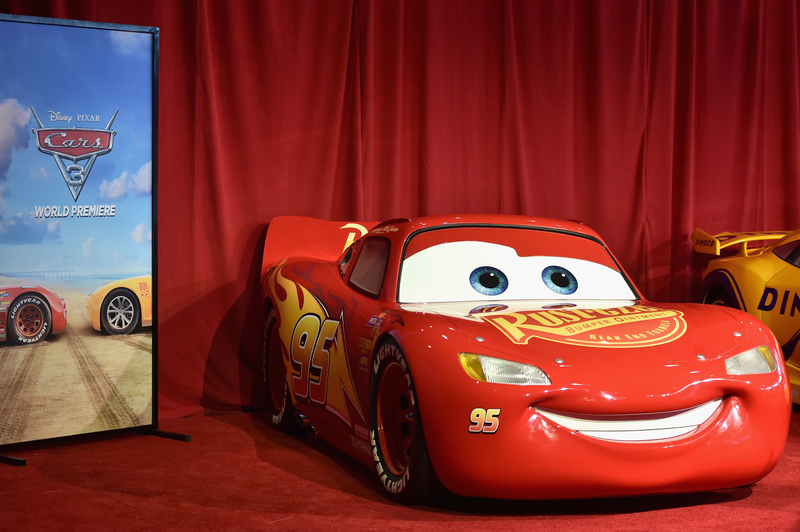 Lightning McQueen (voiced dependably as always by Owen Wilson) is older now – a fact no one refuses to let him forget. A new generation of racers have arrived on the scene, and with their advanced training technology, begin to phase out the veterans. It’s a rapid process as these young cars replace all the older ones, baffling Lightning as he watches all his friends retire. Constantly asked if he’s considering retirement himself, his defiant refusal leads him to declare, “I decide when I’m done.” No one is pushing Lightning McQueen out of the sport he loves, not even ultra-fast Jackson Storm (Armie Hammer). Storm dominated the previews and trailers for this film. He’s less of a rival and more of a threat to Lightning. It’s as if McQueen can’t even compete with this brazen hotshot. If you compared the Lightning of the first Cars with Jackson Storm, you would find that they’re both incredibly cocky, but Jackson is more insufferable and unlikable by far. Lightning and his rival Chick Hicks (who makes an appearance in this film, voiced by Bob Peterson this time), both traded insults and boasted of their skills in Cars. Jackson Storm cuts a little deeper. For him, it’s not only about winning – it’s about pushing these older cars off the road and reminding them at every turn that they don’t belong anymore. This is what our beloved #95 is up against. Can he master the new technology? Will he make a grand comeback? Is he finished or is he only just beginning? A devastating crash is the turning point, forcing Lightning to retreat in seclusion to Radiator Springs and reflect on his options. He decides that retirement is still out of the question, and with some much needed encouragement from Sally (Bonnie Hunt), sets out to begin training. Lightning gets a brand new, state of the art training center, complete with the very same racing simulator that all the rookies train with. His new sponsor (say goodbye to Rusteze!) is the shrewd Sterling (Nathan Fillion), who is later revealed to be more concerned with building the McQueen brand. His new trainer is bubbly and irrepressible Cruz Ramirez (Cristela Alonso), as sunny as her bright yellow paint. Cruz is an experienced technician and trainer, eager to work with her idol, whom she dubs her senior project. (Lightning is old and never hears the end of it). Her senior project proves to be a little too impatient to use the new equipment – which results in damage to the simulator. What’s more, Sterling doubts whether Lightning can race at all. He’s prepared to just market the McQueen legacy but Lightning sets an ultimatum. He’ll train with Cruz – the old fashioned way – for the Florida 500. Whatever the outcome of that race, he still decides when he’s done. Cars 3 is really not your typical comeback story. From the previews, it looked as if Lightning would need to adapt in order to keep up with this new crop of rookies. This is a story about learning to evolve and it offers a grounded, realistic approach to dreams, quite a mature outlook for a film series that’s been derided as mere kids stuff. The old school figures prominently in Cars 3, with its frequent flashbacks to Lightning’s late mentor, Doc Hudson (Paul Newman). Hearing Doc again, seeing him briefly, is one of the most emotionally fulfilling aspects of this latest installment. His spirit is truly alive in this film and his role lends added meaning to the story, as he inspires Lightning on his journey. Hud as he’s called (perhaps a reference to Newman’s 1963 film, Hud? ), was once the Fabulous Hudson Hornet, the greatest ever. McQueen discovers that he’s at the same point in his career as Doc was following his career ending crash. Doc never retired of his own free will; he was forced out and told to make room for the younger cars. Lightning is determined to avoid that fate. And avoid it he does. There is a moment in Cars 3, one so glorious, that it caused the audience at my screening to erupt into cheers and applause. I never would have thought it possible, that any film in this series could elicit such a response. For many of us fans, Pixar films are still excellent, including the less critically acclaimed. Once considered the best in American feature animation, the studio is now underestimated, because of its sequels, because Cars 2 is their unforgivable misstep, according to many. This trilogy has drawn tepid responses at best and flat out antagonistic ones at worst. But Cars 3 more than justifies its existence, and not only because of that pivotal scene. And do not underestimate Cars 3! A recent IndieWire feature on animator Jude Brownbill highlighted the film’s theme of female empowerment. Cruz isn’t merely there to guide Lightning to victory. She’s got a story as well, a sobering one that wakes McQueen up to how much he’s taken for granted. Making Cruz such a central character further solidifies Pixar’s commitment to bringing well rounded female characters to the screen. 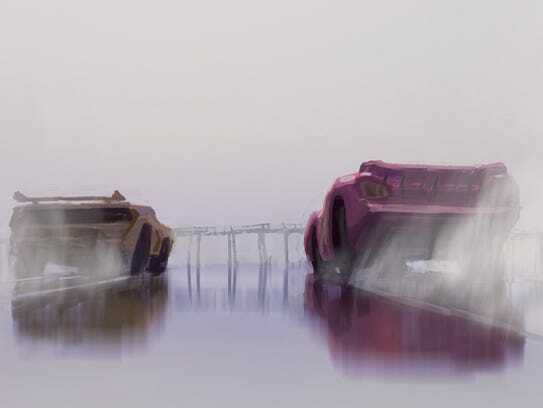 Cars 3 boasts gorgeous animation and art work as well. Some might think it’s not one of Pixar’s most visually inventive films, but glossy paint jobs that gleam, rigging character models of cars so they’re just as expressive as human characters, is really no small feat. Even the designs are impressive, with little touches of human characteristics. When looking at McQueen and Storm side by side, their contrast is quite stark; the rookie is youthful and sleek, much more angular in appearance. We’re treated to lovely scenery too, a dazzling array of color palettes, bright and warm hues, sparkling water surfaces, and thrilling action set pieces that set the heart racing. Brian Fee delivered on his promise of making this film return to its roots. It showcases a reverence for the culture of racing and cars that was so keenly, vividly realized in the original film. Randy Newman’s score is another throwback, transporting us to this weird, wonderful universe. The complaints that the world of Cars lacks logic strike me as very odd. Character is what counts, and the filmmakers have always imbued these anthropomorphic cars with abundant appeal and personality. Cars 3 is an unexpected film, just brimming with heart and passion. As I said, it’s really not a typical comeback story. It’s something much more inspiring. See it in theaters this Friday! Upcoming Pixar will be covering the Cars 3 press conference tomorrow in Anaheim, CA. Both the cast of the film (Owen Wilson, Larry the Cable Guy, Nathan Fillion, etc) and director Brian Fee will be in attendance. Submit your questions in the comments below or tweet us your inquiries for a chance to be featured during the press event! Cars 3 is zooming into cinemas next Friday, June 16th. Here’s one more brand spankin’ new trailer to keep your adrenaline pumping until then. One more dream ⚡ One last chance ⚡ One more week ⚡Watch the final trailer for #Cars3. 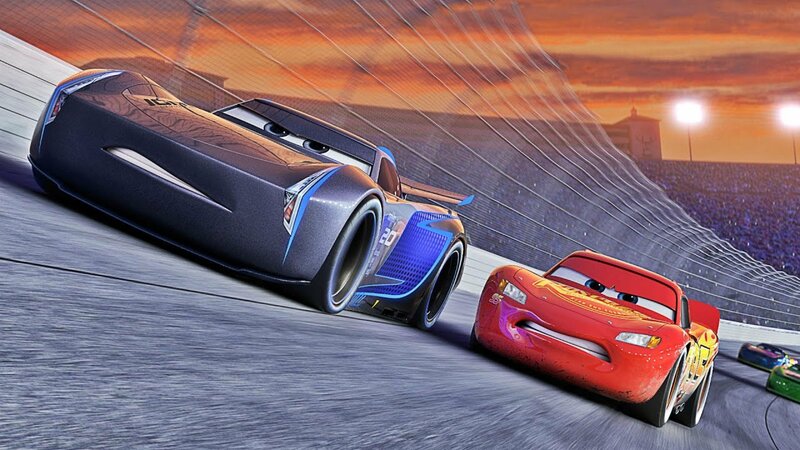 In Cars 3, Lightning McQueen is no longer the sleek machine he once was. His new trainer is Cruz Ramirez, a yellow racing car who helps him train for the Daytona 500. Owen Wilson will be reprising his role as Lightning, but no one has yet been confirmed for Cruz Ramirez. Cruz is a Hispanic female racing car. No doubt her character will be very interesting to watch and will be another addition to Pixar’s ever growing heroines. Cars 3 will be racing into theaters on June 16th, 2017. In the meantime, check out the breathtaking concept art below.